A whopping 70% of Americans are having more than the recommended amount of saturated fat (1). Are you one of them? Saturated fats may elevate bad cholesterol levels and increase the risk of heart disease (2). These fats can cause a host of other serious ailments. But wait, these are saturated fats – not just any type of fat. Over the last two decades, fats have been mercilessly demonized. People started cutting down on fats – without a thought. And that has only done more harm than good. If you think giving up on delicious foods is the only way to cut down on bad fat, wait. Sit back and hold your thoughts. Keep reading. How Can High-Fat Foods Be Healthy? What Are The Healthy High-Fat Foods? What Are The Side Effects Of Excess Unsaturated Fats? Perfectly legitimate question. For the answers, we must first know what the different types of fats are. Fats are broadly classified into unsaturated and saturated. Unsaturated fats are further categorized into monounsaturated and polyunsaturated. In simple terms, unsaturated fats are healthier fats. These are the fats you need to consume. These fats reduce the risk of heart disease (3). While monounsaturated fats help lower your cholesterol levels, polyunsaturated fats aid muscle movement and blood clotting. Omega-3 and omega-6 fatty acids are two types of polyunsaturated fats. There’s a ton of research supporting the ability of omega-3 fatty acids in preventing chronic disease and dangerous ailments (4). There is some research showing the cardioprotective effects of omega-6 fatty acids as well – though there are debates about their inflammatory role and possible harm. Also, though a large body of research suggests that saturated fats are bad, some studies find no possible link between this type of fat and disease (5). Nonetheless, we recommend you cut down on saturated fats and increase your intake of the unsaturated kind. All in all, fats are important – when they are of the unsaturated kind. All the super-healthy high-fat foods contain them. Let’s take a look at them now. The unsaturated fats in nuts are thought to lower bad cholesterol levels, as per some reports. Nuts are also quite replete with omega-3 fatty acids, which help preserve heart health (6). 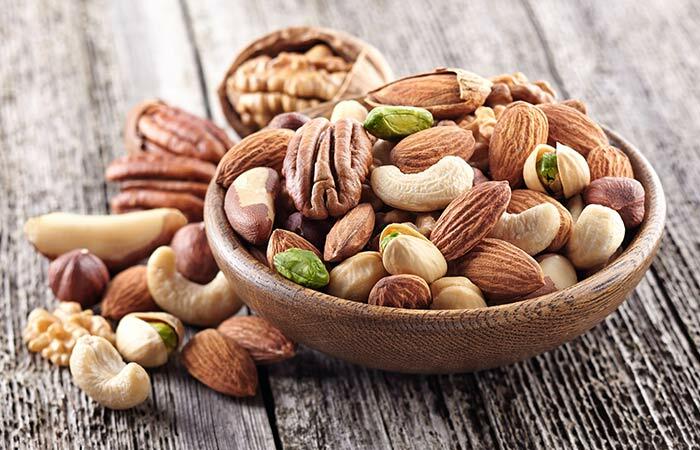 The unsaturated fats in nuts, especially in almonds or hazelnuts, were found to lower bad cholesterol while elevating good cholesterol levels (7), (8). Walnuts are also great sources of omega-3 fatty acids and alpha-linolenic acid. Studies show they may have the ability to increase inferential reasoning in individuals (9). You can sprinkle almonds on top of yogurt. Or top hot or cold breakfast cereal with nuts for a great start to the day. Caution: Nuts are high in calories and eating too many of them can result in calorie overload. Hence, consume nuts in limited quantities (not more than a handful). Seeds are potent sources of monounsaturated and polyunsaturated fats. In fact, flaxseeds are among the richest sources of omega-3 fatty acids. And for non-fish eaters, they are the best source of these healthy fats (10). Even chia seeds are great sources of omega-3. In a study, the seeds were found to increase blood levels of EPA (eicosapentaenoic acid, an omega-3 fatty acid) (11). You can add ground flax seeds to smoothies or oatmeal. Combine different seeds to make a trail mix. Sprinkle sunflower seeds over your evening salad. You can add chia seeds to your pastries and puddings. Avocados are great sources of both monounsaturated and polyunsaturated fatty acids. Thanks to these, they can be a part of a heart-healthy diet plan (12). Majority of the fat in avocados is oleic acid, which is also linked to lowered inflammation (13). This acid can also have positive effects on genes linked to cancer. 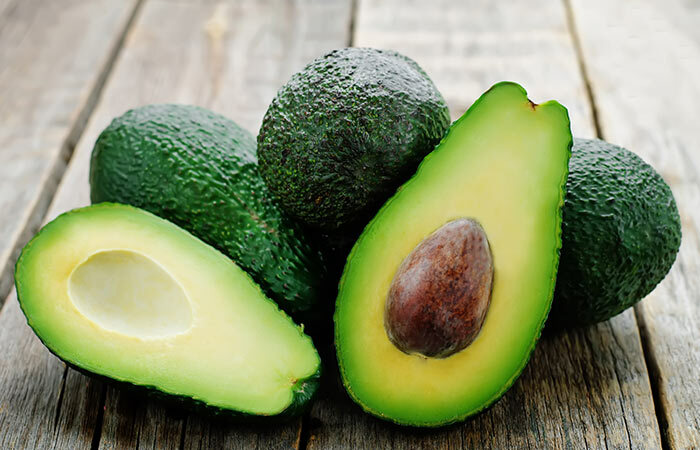 Interestingly, the monounsaturated fats in avocados can promote the absorption of antioxidants like beta-carotene (which is fat-soluble), thereby enhancing vision health (14). Add slices of avocado to scrambled eggs and have them for breakfast. You may also replace the butter or mayonnaise on your breakfast toast with slices of avocado. Though coconut oil contains unsaturated fat, what contributes most to its benefits are its saturated fats. The oil contains a special type of healthy saturated fats, called medium-chain triglycerides (MCTs). These triglycerides are shorter than most fats found in our food (which are long-chain triglycerides). Studies show that the MCTs in coconut oil can increase energy expenditure, thereby inducing fat burning (15). Coconut oil is 92% saturated fat, and lauric acid is one of the main constituents. This acid, as per studies, can fight inflammation and microbial infections (16). Surprisingly, the saturated fats in coconut oil could also increase good cholesterol levels in participants in a study (17). Of course, this has more to do with the chemical structure of the saturated fats in coconut oil. Otherwise, saturated fats by themselves are not healthy. At least, not most of the time. Use coconut oil to cook your favorite dishes. You can also replace other oils and butter in your recipes with coconut oil. The healthy fats in dark chocolate come from cocoa butter. These fats are made of oleic, stearic, and palmitic acids. Though stearic and palmitic acids are saturated fats, while stearic acid has a neutral effect on blood cholesterol, palmitic acid is so low in concentration for it to have any severe impact (18). But, of course, moderation is key here. 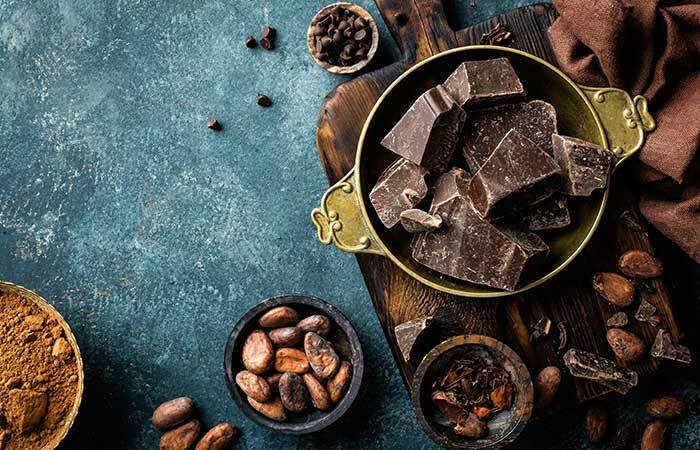 The oleic acid in dark chocolate is considered hypocholesterolemic (cholesterol-lowering) and can even be protective against coronary heart disease (19). Drizzle some hot chocolate over your breakfast cereal or fruit salad. You may also add dark chocolate chips/cubes to your morning smoothie. Salmon is one of the richest sources of omega-3 fatty acids. Though the fatty acids are present in most fish, those like salmon are richer – as they store a lot of the oils in their muscles. Studies show that omega-3 fatty acids can cut the risk of heart disease and even promote vision health in adults (20). EPA and DHA, the two omega-3 fatty acids found in fatty fish, are crucial for brain development as well. They are abundantly present in the cell membranes of brain cells, facilitating communication between brain cells (21). Other fatty fish with beneficial unsaturated fats (omega-3s) include sardines, mackerel, and anchovies. You can have poached salmon, along with herbs, for breakfast. You may also add smoked salmon and cream cheese on sprouted-grain bread, with cucumber or tomato slices. Caution: Pregnant and breastfeeding women must be careful while choosing fish to avoid complications from possible contamination. Spirulina is another good source of omega-3 fatty acids. Several preclinical studies have established spirulina’s hypolipidemic effects. Supplementation had shown to reduce total serum cholesterol levels, in addition to increasing the levels of good cholesterol (22). 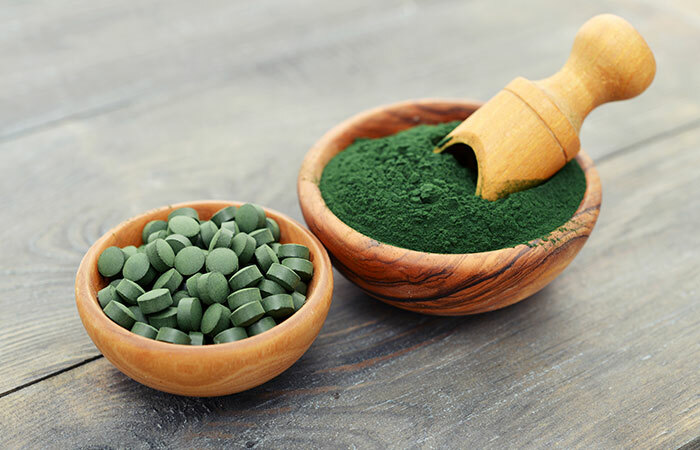 Spirulina is most commonly available in the form of powder and tablets. You can simply mix the powder in a glass of water and drink it straight. Eggs, especially those enriched with omega-3s, can be quite beneficial. Studies show the intake of such eggs can lower serum triglyceride levels (23). Evidence also suggests that regular intake of eggs can help prevent chronic and infectious diseases (24). Have 1 to 2 boiled eggs every day, for breakfast. Egg omelets can be a great combination with your breakfast toast as well. 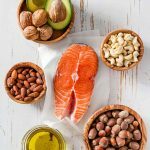 These are the foods that contain the highest amount of healthy fats (especially omega-3). Including them in your regular diet can do wonders for your health. But there’s a catch – you can’t have too much of these healthy fats. Excess of unsaturated fat (omega-3 and omega-6, both) can cause undesirable effects. Studies show excess of omega-3, especially in type 2 diabetes patients, can elevate blood glucose levels (26). Treatment with omega-3 fatty acids was found to cause diarrhea and acid reflux (27). This is rare, but it may happen. Excess dietary fat intake can even lead to indigestion, as per a few studies (28). Stroke occurs due to bleeding in the brain, which is caused by the rupture of blood vessels. 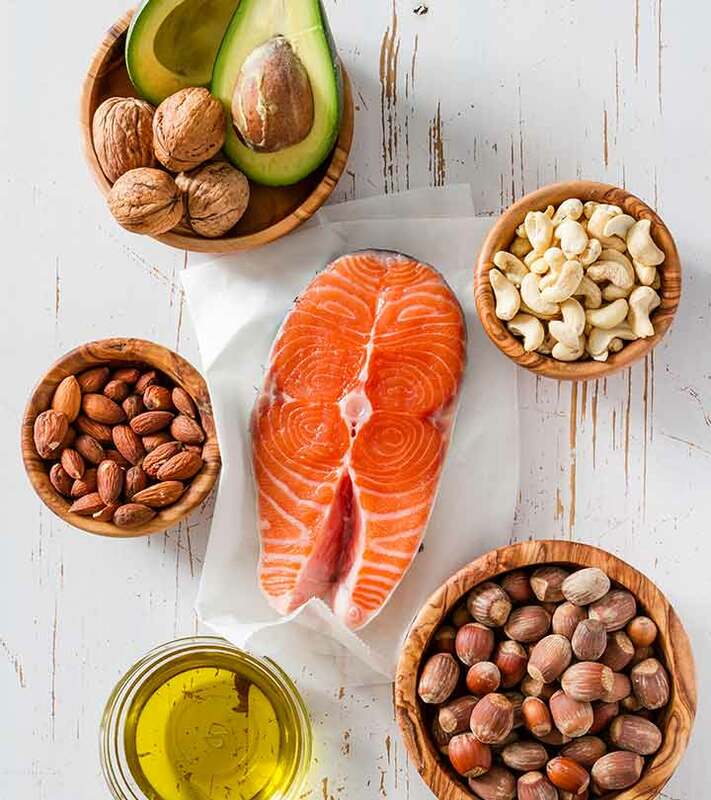 Certain animal studies show unsaturated fats like omega-3 fatty acids may decrease the blood’s clotting ability, thereby increasing stroke risk (29). Studies show that omega-3 fatty acids can lower blood pressure (30). This can be beneficial for people with high blood pressure levels. But those with low blood pressure or on medications for low blood pressure may face issues – as the fats may lower their blood pressure way too much. Excess of omega-6 fatty acids is also harmful. Research suggests this can lead to several chronic inflammatory ailments (31). Fats are not bad. Our bodies need fat. You just need to mindful about the type of fats you ingest and the amount. Don’t go overboard. Include the foods we listed in your diet today. Did we miss listing any other food rich in healthy fats? Let us know by commenting in the box below. “Current eating patterns in the United States”. Office of Disease Prevention and Health Promotion. “Cut down on saturated fats”. Office of Disease Prevention and Health Promotion. “Saturated fats compared with unsaturated fats and sources of…”. Journal of the American College of Cardiology, US National Library of Medicine. “Omega-3 fatty acids”. US Department of Health & Human Services, National Institutes of Health. “Meta-analysis of prospective cohort studies…”. The American Journal of Clinical Nutrition, US National Library of Medicine. “Nuts and your heart…”. MayoClinic. “Dietary almonds increase serum HDL cholesterol…”. The Journal of Nutrition, US National Library of Medicine. “Effects of regular consumption of different forms...”. European Journal of Nutrition, US National Library of Medicine. “Effects of walnut consumption on cognitive…”. The British Journal of Nutrition, US National Library of Medicine. “Flaxseed – a potential functional food source”. Journal of Food Science & Technology, US National Library of Medicine. “Supplementation of milled chia seeds increases…”. Plant Foods for Human Nutrition, US National Library of Medicine. “Hass avocado composition and potential...”. Critical Reviews in Food Science and Nutrition, US National Library of Medicine. “Dietary factors that promote or retard...”. Arteriosclerosis, Thrombosis, and Vascular Biology. US National Library of Medicine. “Carotenoid absorption from salad and salsa...”. The Journal of Nutrition, US National Library of Medicine. “Medium chain triglycerides enhance exercise…”. PloS One, US National Library of Medicine. “Comparison of antibacterial efficacy of coconut oil...”. Journal of International Society of Preventive & Community Dentistry, US National Library of Medicine. 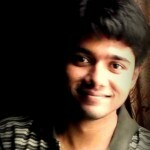 “A coconut extra virgin oil-rich diet increases HDL...”. Nutrición Hospitalaria, US National Library of Medicine. “Heart healthy benefits of dark chocolate”. Cleveland Clinic. “Chocolate and prevention of cardiovascular…”. Nutrition & Metabolism, US National Library of Medicine. “Farmed salmon Vs. wild salmon”. Washington State Department of Health. “Long-chain omega-3 fatty acids and…”. Frontiers in Aging Neuroscience, US National Library of Medicine. “Hypolipidemic, antioxidant, and…”. Cardiovascular Therapeutics, US National Library of Medicine. “Decrease in blood triglycerides associated with the...”. Nutrition, Metabolism, and Cardiovascular Diseases, US National Library of Medicine. “Egg and egg-derived foods: effects on...”. Nutrients, US National Library of Medicine. “Fat: What you need to know.” Cleveland Clinic. “Elevated plasma glucose and lowered...”. Diabetes Care, US National Library of Medicine. “Overview of omega-3 fatty acid therapies”. P&T, US National Library of Medicine. “Dietary fat intake and functional dyspepsia”. Advanced Biomedical Research, US National Library of Medicine. “Dietary supplementation of omega-3 polyunsaturated...”. Experimental Neurology, US National Library of Medicine. “Effect of omega-3 fatty acids on blood pressure and…”. Journal of Research in Pharmacy Practice, US National Library of Medicine. “Health implications of high dietary omega-6...”. Journal of Nutrition and Metabolism, US National Library of Medicine.